It took me a solid two days, but here I am reporting in from Jönköping, Sweden! 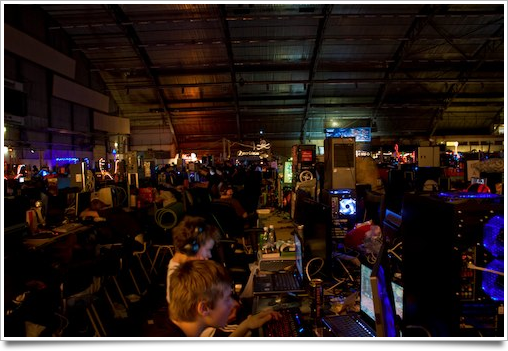 I took a good amount of time to take a plethora of pictures, use my press access to get to hard-to-reach places, and select and edit photos to give you a nice impression of the crazy little universe that’s known as Dreamhack. 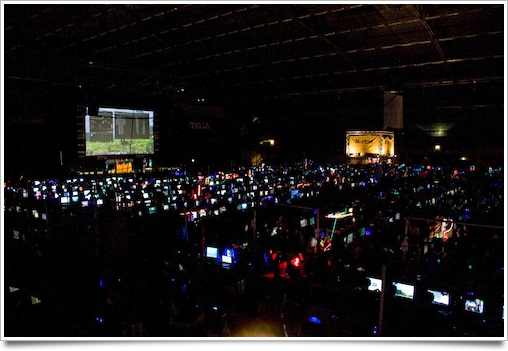 If you didn’t read it in my last post: Dreamhack is the world’s biggest computer festival. Me and 12-15 thousand other geeks are here and try to make the best of it. 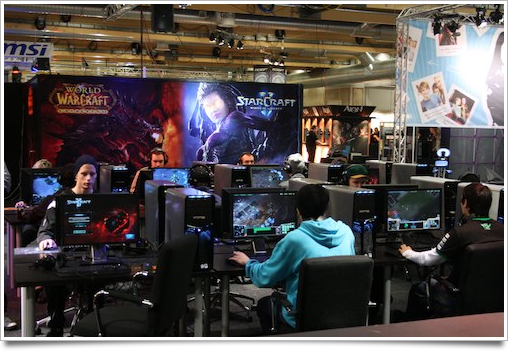 Apart from file sharing and playing games, there’s opportunities to compete in the so-called ‘eSports’ ladders, sit in a tank of the Swedish army, try and win laptops, play pre-release games like RUSE, World of Warcraft: Cataclysm and Starcraft 2, and much more. 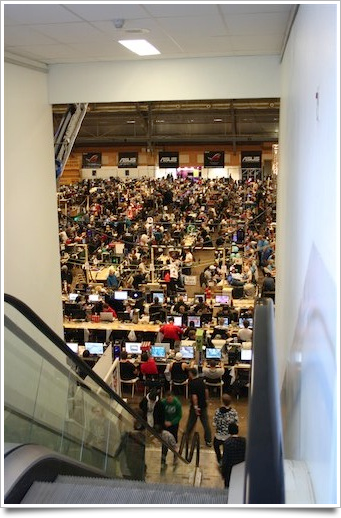 In fact, there’s so much to do that you’d probably be fine without a computer, but over tenthousand gamers with their box on one of the tables in Dreamhack’s many halls beg to differ. Read on for a link to the flickr set, my trip here, and impressions of the venue floor. 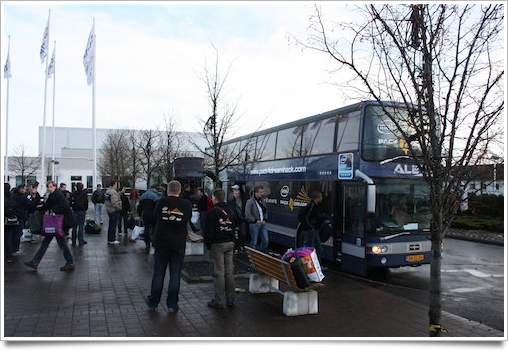 As I mentioned, Intel and Asus are sponsoring the bus trip, which was quite noticeable to us when we were picked up. 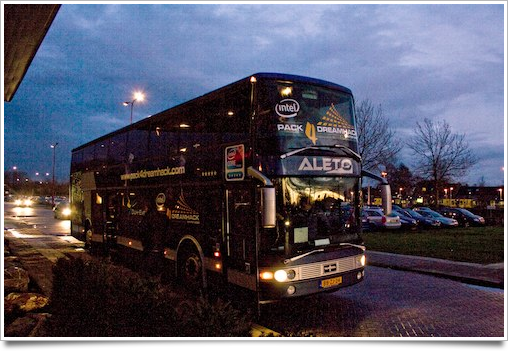 The bus took us from the Dutch Utrecht to the Dreamhack venue, a trip totalling about 1100 kilometers (or almost 680 miles). It took us about 22 hours of traveling to arrive here. The trip here was nice, apart from getting stranded for about three hours in the North of Germany when the bus’ transmission broke down in the middle of the night. 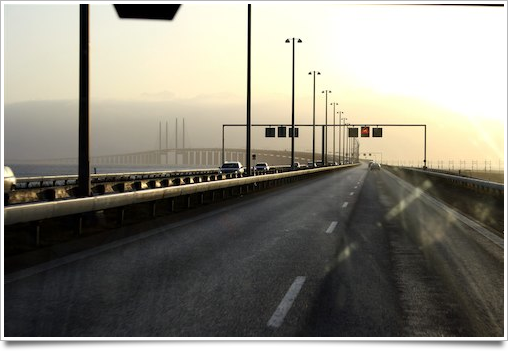 We took a ferry from Germany to Denmark and went over one of Europe’s most beautiful bridges. Once we finally arrived, we took some time to stretch our tired limbs and check in, and in my case pick up a press pass and start exploring the venue. We arrived about three hours after the first check-in started, so there wasn’t a huge queue to hold us up – a relief, to say the least. 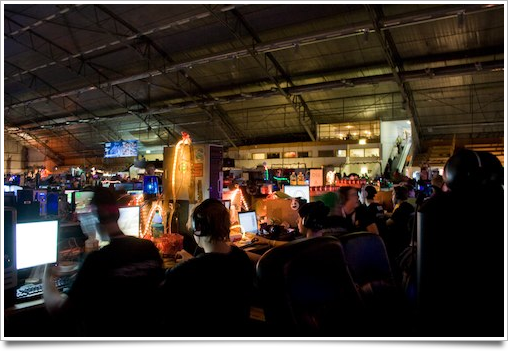 A bit about the venue: Dreamhack is separated into a few main areas: the three halls, Hall A, B, and D, are home to the BYOC folk (Bring Your Own Computer). Hall A, where we were all seated in a big Dutch row, is known as the eSport hall, because all the big tournaments are played here, and it’s relatively calm compared to B and D. Hall B is located right next to the expo floor, where companies demo equipment, games, software, or do other promotional things. It’s very similar to your typical expo floor. 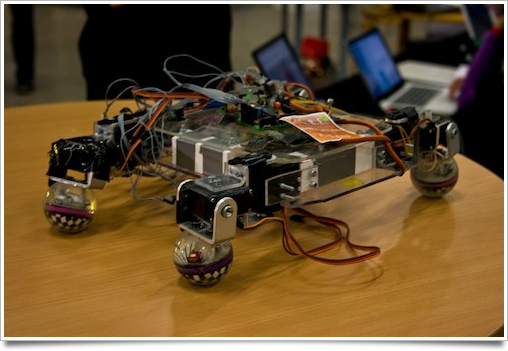 Hardware demos, robots, you name it, it’s there. 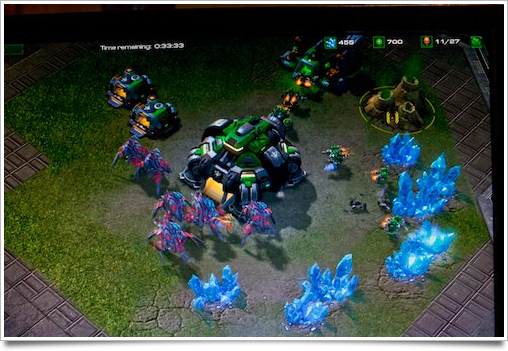 I also got a shot at playing new games there, like Starcraft 2 (which, incidentally, is a great game). 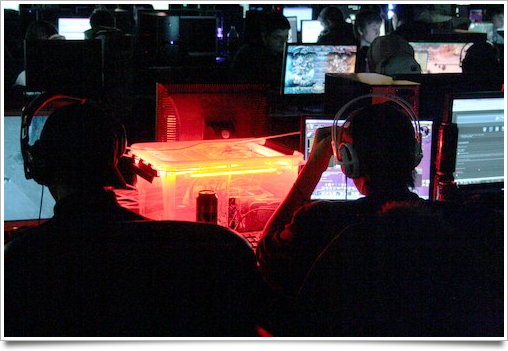 And also opportunities to win stuff, like a shiny new laptop. 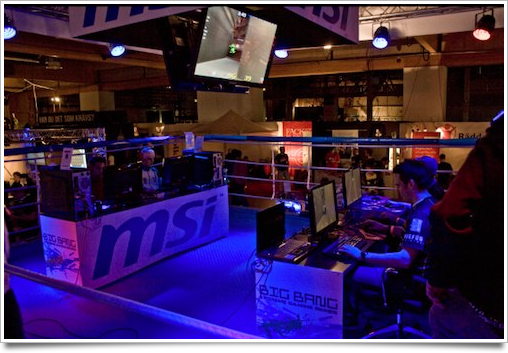 If you can beat these two pro players at their game in an actual boxing ring, MSI will give you and your friend a new laptop. So far there’s been no winners. If you cross it, however, and descend the stairs into Hall D, you find the largest hall of them all. 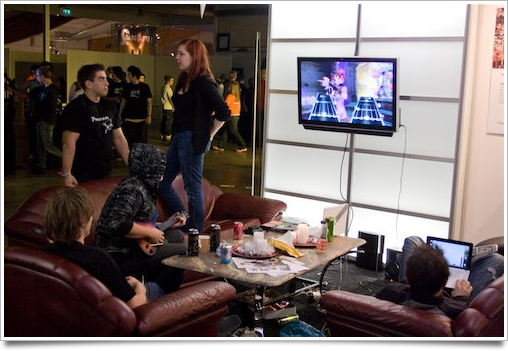 Hall D has a stage, where fun and crazy little contests are held, music is performed, and the hall itself is full of places to eat and drink. It’s certainly an eventful place to be. Well, that’s it for now. View nice high-res versions of the photos and even more pictures at the Flickr set here. I hope to do one last small report before I head out in 24 hours. If you still want to meet up, hit me up soon! wow, awesome pics. love the 180 degree panorama. It looks very impressive. No wait, it is very impressive. Unfortunately this is not the place to be for me. I want stuff organized while having fun. 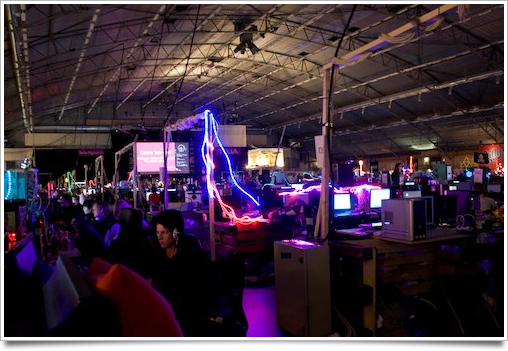 This looks like a big LAN-party where 50% of the stuff you brought with suddenly disappeared! What are you using for your photo border CSS element? May I steal it? I love it. 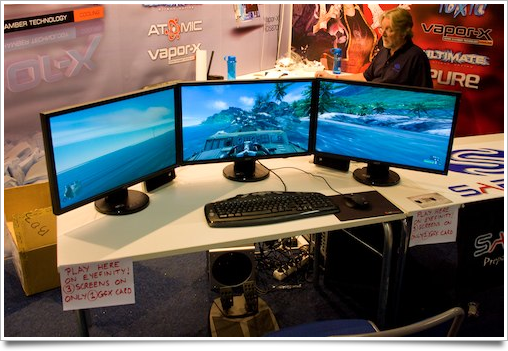 You got to play Cataclysm? You lucky duck! I’m an avid WoWer >_>. Wish I could go to these!